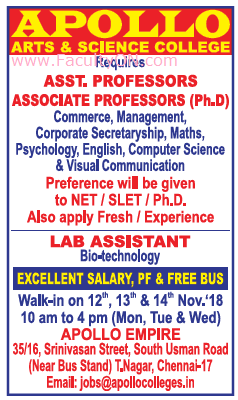 Apollo Arts and Science College, Chennai has advertised in THE HINDU newspaper for recruitment of Associate Professor / Assistant Professor Plus Lab Assistant jobs vacancies. Interested and eligible job aspirants are requested to walk-in on 12th, 13th and 14th November 2018. Check out further more details below. About College: Apollo Arts and Science College is part of the Apollo Group of Educational Institutions having rich experience in the field of Education, with Apollo Engineering College, Apollo Priyadarshanam Institute of Technology, Apollo College of Education, Apollo Polytechnic College, Apollo Subulakshmi Polytechnic College, Apollo Computer Education Ltd., - an IT Training Public Limited Company. How to Apply: Interested and eligible candidates are requested to appear for Walk-in interview with their CV along with originals / copies of certificates and recent PP size photo to the walk-in address provided below.